They may be known as “ships of the desert” and very well adapted to extremely arid environments but the evolutionary history of camels and their close relatives may have their origins in anything but desert habitats. A University of Manchester team has been assisting a group of Canadian scientists helping to identify a series of fossilised bone fragments found in the High Arctic region of Canada. The pieces of bone are from a species of giant camel, one that was quite at home in a habitat that was over 79 degrees latitude north, although during the past, when this ruminant roamed, the climate was generally a little warmer than the High Arctic of today. The fossilised remains of the camel were discovered in a Pliocene aged deposit located near Strathcona Fiord on Ellesmere Island. The fossil site known as the Fyles Leaf Bed site has provided palaeontologists with an insight into life in this part of the world around 3.5 million years ago. Although there may be only one type of woody tree native to Ellesmere Island today (a type of willow), Ellesmere Island during the Piazencian faunal stage of the Pliocene, in the periods when ice sheets retreated, was a largely arboreal environment dominated by alder, birch and larches. Sharing this woodland world with the camels were bears, beavers, badgers, rabbits, deer and rodents. Team members trek up the slopes on Ellesmere Island to the fossil site. Camels belong to a group of mammals known as the Artiodactyls (even-toed hooves). The first camels are believed to have evolved in the Eocene Epoch, around 55 million years ago and over one hundred fossil species have been identified and named, although the Ellesmere Island discovery represents the furthest north any camel fossils have been discovered to date. Carefully removing a fragment of bone. Although extant camels are strongly associated with desert environments, these ruminants were much more abundant in grassland and woodland habitats. Two groups of Artiodactyls (camels and bovoids such as cows) evolved a special way of digesting tough, fibrous plant material – rumination. Once swallowed, food enters the first of three or four stomachs in the animal. It is regurgitated and chewed a second time, this is known as chewing the cud. Thus the plant material is subjected to two physical breakdown processes and these physical/mechanical processes are aided by micro-organisms that inhabit the digestive tract of the ruminant and assist in the chemical breakdown of the plant material, including the cellulose. The micro-organisms live in a symbiotic relationship with their hosts. Importantly, ruminants such as camels recycle urea, one of the body’s waste products, this is used to help nourish the micro-organisms living in the gut. As a result of this urea recycling less urine is produced and less water wasted. This adaptation has enabled animals such as camels to survive in very dry environments such as deserts. However, as efficient processors of plant material with an ability not to waste too much water, these adaptations gave camels an ability to survive in other habitats that were arid and dry, such as those to be found a high latitudes. Camel bone fragment in situ. The Canadian research team were unsure of the identity of the fossilised bone, which is believed to represent a portion of a tibia (limb bone). They approached Dr. Mike Buckley from the Institute of Biotechnology at Manchester University for assistance as Dr. Buckley and his colleagues have developed a new way of pinning down the type of animal from bone evidence. The technique is called “collagen fingerprinting”, minute amounts of collagen, the main protein constituent of bone had been preserved in the fossils. By extracting a portion of the preserved collagen, the Manchester University team were able to identify unique chemical markers in the peptides (chains of amino acids) that are present in collagen. These markers provided the researchers with the unique “fingerprint” that identified the bone pieces as being from an extinct type of camel. 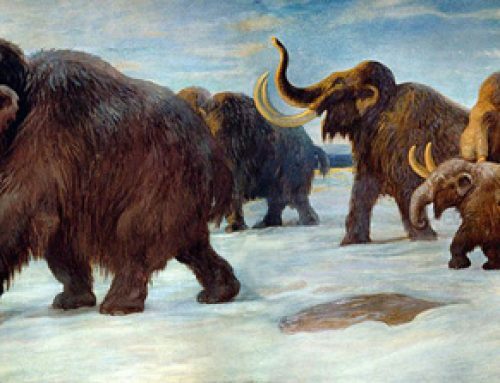 Once the data had been established, it was simply a case of using results on tests from extant and known extinct animals to find the closest match. Thirty-seven extant mammal profiles were examined as well as data from the study of an extinct type of giant camel, whose fossilised remains had been found in the Yukon. The analysis showed that the 3.5 million year old specimen closely matched the data from a modern Dromedary camel, as well as the Ice Age camel remains found in the Yukon. Using this information, the Canadian team were able to report that the fragments of bone represented a species of giant camel that lived as far north as Ellesmere Island. The scientists know that this is a very large species, much bigger than today’s extant Dromedaries as the bone fragments represent a tibia that is nearly a third bigger in the fossil specimen when compared to the tibia in modern-day Dromedaries. These delicate fragments are currently being stored at the Canadian Museum of Nature’s research and collections facility in Gatineau (Quebec Province). The University of Manchester’s Dr. Roy Wogelius (School of Earth, Atmospheric and Environmental Sciences) was able to conduct an analysis on the mineral content of the fossilised bone fragments. His research suggests that it was a combination of the way in which the fossils were permineralised along with the very cold temperatures in that region that permitted the ancient organic remains to be preserved for over three million years. This is a remarkable discovery, finding bone from the Mid Pliocene that can still yield protein data. There has been much debate recently over the ability of organic traces to remain viable in the fossil record. For example, recent research on extinct Moas from New Zealand provided an insight into the proposed half-life of DNA. Dr. Buckley commented that this was the first time that collagen had been extracted from such extremely old animal remains. Exclaiming that the project had been a particularly exciting one to work on he was delighted that the type of animal had been identified from the “collagen fingerprinting” technique. The fragments of fossilised camel bone. This research has implications for our understanding of the evolution of the camel clade. Dr. Rybczynski stated that this discovery sheds new light on the evolution of extant camels, perhaps suggesting that primitive camels first evolved in North America. Specialisations seen in today’s camels such as an ability to store fat, to survive arid conditions and their broad, two-toed feet may be adaptations for living in a dry, polar habitat.